The tectonic plates of the earth change their locations to each other in different directions and at different speeds. 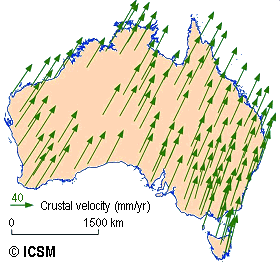 The Australian plate moves with a relative high speed of about seven centimeters per year in northeastern direction in relation to the earth fixed ITRS which is used for GPS reception. It follows that a point measured by GPS one year later has a coordinate that has been shifted seven centimeters. Since the implementation of the previous Australian datum, the "Geocentric Datum of Australia 1994" (GDA94), the Australian plate has moved about 1.6 meters northeast. The coordinates defined in the GDA94 no longer match the current measurements of the global satellite navigation system GPS. Differences of this magnitude are, for example, for navigation of self driving vehicles, for automated mining and precision agriculture and for cadastral surveys no longer acceptable. To address the problem, Australia has implemented a new datum known as the "Geocentric Datum of Australia 2020" (GDA2020). The change to GDA2020 will affect all organizations in Australia that are using spatial information including transport, agriculture, construction, mining, environmental protection, utilities management, insurance, banking, emergency services, telecommunications and scientific research. Following the publication and approval of the new coordinate reference system by the Australian authorities, KilletSoft has integrated the GDA2020 / MGA2020 into its TRANSDATpro and GeoDLL software. This software also supports the two variants of the new high-precision NTv2 grids GDA94_GDA2020_C and GDA94_GDA2020_CD, which have just been released for the continent-wide conversion between GDA94 and GDA2020. Both grid files and a detailed explanation can be downloaded directly from the KilletSoft website http://www.killetsoft.de/homee.htm by clicking on the entries TRANSDATpro or GeoDLL in the navigation bar and then using the link to the NTv2 page. There you will also find a compilation of the worldwide free available NTv2 files.